As the mango season in the US kicks off, here’s where to get your fleshiest and juiciest Indian mangoes from. Will Cavan, of International Mango Organization, describes Savani Farms as the best place to buy Indian mangoes. Known for importing the best varieties of Kesar and Alphonso from India, Savani also gets Langra, Chausa, Dashehari, Banganpalli, Totapari and many other varieties on demand, all of which is exported from India directly. Boxes of a dozen mango are shipped anywhere in the US. 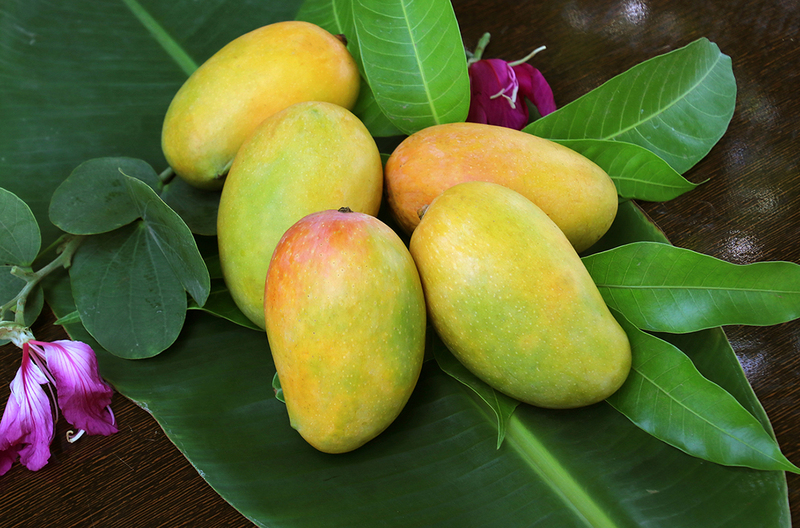 The mangoes are grown and ripened naturally in farms at Andhra Pradesh, India. You can make an order for Alphonso, Banginapally, Kesar or Dasheri among other varieties all of which are delivered to the US. Another popular source to ship mangoes to the US, Mangozz ships mangoes through air, plucking the fruit at the ripest time to ensure the best yield. All mangoes are APEDA and USDA certified before they arrive in the US. The go-to place for all things Indian and a walk into the lanes of India of the ’80s, at Patel Brothers, you will get everything desi, including the famed mangoes. After the 17-year-long Indian mango ban was lifted in 2007, the grocery chain has been religiously stocking the Indian mangoes that arrive in petis and fill the stores with decadent aroma. At your local Patel Brothers store. A family owned farm in Southern California, Wong Farms grow Keitt and Valencia Pride mangoes, both of which are cultivars from the Mulgoba variety of mangoes from southern India that was planted in Florida during the 1900s. The mangoes from the Wong Farms can be found at Santa Monica Farmers Market on Wednesdays from July through September. Patrons suggest that you must arrive early to lay your hands on these fat, juicy fruits as they sell out quickly. A small family farm in Delray Beach, Florida, Truly Tropical produces over 50 varities of mangoes including Kesar, Bombay, Mulgoba, Neelum, East Indian, Son Pari, and many others. What’s more is that it also offers fruit picking during the season. Described as the finest mangoes along the Indian River Lagoon, the Meritt Island, Florida farm grows special hybrids including the Keitt and Valencia Pride originated from the Indian Mulgobas. The Florida Farm ships across the US and fruits are also available to pick up at the farm stand during season. Erickson Farms have various varieties including the Keitt. Said to be one of the best mangoes in Hawaii, the farm has 70 trees and 12 different varieties of mangoes available at local Whole Foods. The bonus – they also sometimes conduct mango workshops such as the grafting workshop last year. If you are in India you should definitely buy them from Mangoes Mumbai the no 1 indian player for best alphonso mangoes. I have a C2 organic Certification for my 15 acre mango in Dapoli situated on the western konkan belt. There are 400 Alphonso mango trees. I would also want to export to various countries and please tell me how.